This cool café is perfect for your next adda session with the squad. 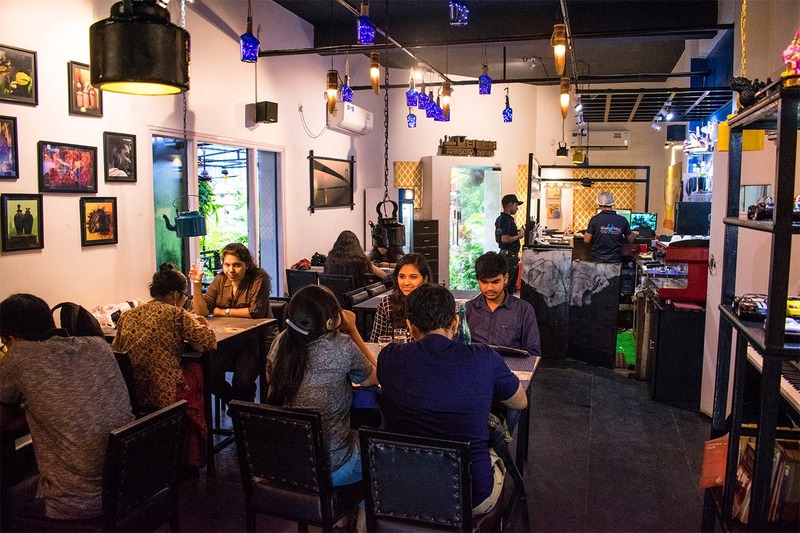 Complete with quirky décor and outdoor seating, Blue Mug should be on your list of go-to places for the monsoon. Tucked away in the lanes of Jodhpur Park, Blue Mug is the place to go hang out if you are on a student budget. It’s light on the pocket and the easy-going and relaxed atmosphere will keep you coming back again and again. Don’t miss the kettle lamps and glass bottles filled with fairy lights used as décor. We love the mismatched chairs (they even have a swing!) in the outdoor seating area which is blocked off from the main road with a thicket of plants. The café is open all day so you can enjoy a everything from a filling breakfast to a high tea. It has very limited seating and fills up really fast so you should avoid peak meal times. The food is Italian or Continental – with an Indian twist. Quantities are generous and you won’t be disappointed. We love the all-day brekkie, the pasta with garlic bread and the sundaes and shakes (of course!). They have fun flavours like caramel and hazelnut that you can add to make your coffee extra yum. For a quick bite, go for a sandwich – they are good value for money. The regulars love the Chicken Club Sandwich and the classic BLT. If you are going for a more filling meal, the cheese fish fry is to die for. The cheese oozes out of the crispy fish – crispy cheesy goodness! The chicken wings and cheese fondue are perfect for sharing. You have to try the Oreo shake – thick, creamy and full of oreo chunks! Affordable and delicious, this is the ideal place to go on a student budget. Popular for its coffee and chicken main dishes (you have to try their Chicken Steak), try to visit on a cool evening so you can take advantage of their outdoor seating since the inside fills up really fast.